Ultrasound technology is used everywhere, and it’s one of the reason that ultrasound technicians are so in demand today. They have the responsibility of providing ultrasound technology to create detailed images of the human body’s internal systems and structures. Ultrasound uses high frequency sound waves that bounce off body tissues to create an image. Today’s ultrasound technician schools train technologists to understand how to use equipment, understand the technology and provide information to patients and physicians. In this way, ultrasound technicians must also understand a bit about diagnosing a patient through the use of an ultrasound. There are various top-notch accredited ultrasound technician schools around the country. This guide goes through what schools to check out for your career, ultrasound technician jobs, salary expectations and requirements for technicians. Most ultrasound technicians study to become diagnostic medical sonographers, but they can also be cardivascular technologists or radiation therapists. In order to become an ultrasound technician, you must pass a certification exam by the American Registry of Diagnostic Medical Sonographers (ARDMS), which requires that you have clinical experience and completion of an accredited program by CAAHEP. There is a great need for diagnostic medical sonographers according to the Occupational Outlook Handbook. Most technicians work full time in hospitals, physician’s offices, private practices and laboratories. They operate special imaging equipment that creates images or may oversee tests on patients. The images and results of the tests will give physicians a better insight into what a patient is experiencing. They can diagnose medical conditions. For that reason, the ultrasound technician must be proficient in medical terminology, illnesses, ultrasound technology and even surgical procedures. Jobs are in high demand for ultrasound technicians. There were 110,400 jobs in 2012, and that number is expected to grow by 39 percent in 2022 adding many new jobs to the workforce. Hours for the job are full time with overnights, weekends and evenings a common part of the job description. Sonographers are much like nurses and must always be ready to assist a physician with a diagnosis. The average pay for a sonographer is $60,350 per year or $29.020 per hour. However that number is at the higher end of the scale. Entry level sonographers can expect about $40,000 to $53,000 per year. The top 10 percent of diagnostic medical sonographers and cardiovascular technologists earn over $90,000 per year. The lowest 10 percent of cardiovascular technologists earedn less than $27,830 per year in 2012. 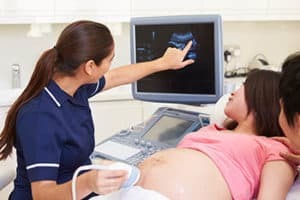 As ultrasound technicians must work in medical settings, they are required to undergo extensive training with sonography equipment in the field. Higher paid sonographers will have a bachelor’s or master’s degree with year of experience in diagnostic medical sonography to obtain a good position at a hospital or physician’s office. However, there are technical certificates and associate’s degrees that students can also use to get a job as an ultrasound technician. Job requirements include that sonographers must have open availability. This means that they may work late hours in a hospital such as overnights and double shifts. There is an opportunity to control more of your schedule if you work for a private practice, but most diangostic medical sonographers work in hospitals. Others work long hours in medical and diagnostic laboratories. Some job requirements are more specific. For example, cardiovascular and vascular technicians work with physicians in diagnosing heart and blood vessel problems in patients. Ultrasound technicians can play an important role in the survival of a patient if they have experience and understand expertly how to use imaging equipment. Much of the work for sonographers revolves around the imaging machine. They also may perform procedures for patients at their bedside or in special rooms. Sonographers are typically on their feet for the majority of the day, and they also must be able to help disabled patients in order to effectively use the equipment for diagnosis. Choosing to become a diagnostic medical sonographer means picking the right ultrasound technician school for your training. With an accredited program, you’ll likely have offers from well known hospitals with the possibility of a higher training. If you would rather gain more experience quickly, you can always start out with a certificate or associate’s degree in sonography technical training. Many sonographers earn more when they work for private physicians, but it’s also a matter of what type of sonography you choose. Diagnostic medical sonographers make more money than cardiovascular technicians on average because they are more versed with several internal problems rather than just heart and blood vessel problems. Finding a career path as an ultrasound technician offers incredible rewards. You get to work in a medical setting helping patients and assisting doctors every day. The work that you do can save someone’s life. If you train with the right program, you can also make an incredible salary and choose wherever you want to live. Since the demand is so high for diagnostic medical sonographers, you may have a number of locations around the world to select from if you graduate from a four-year accredited program. It’s all up to you how far you want to go.